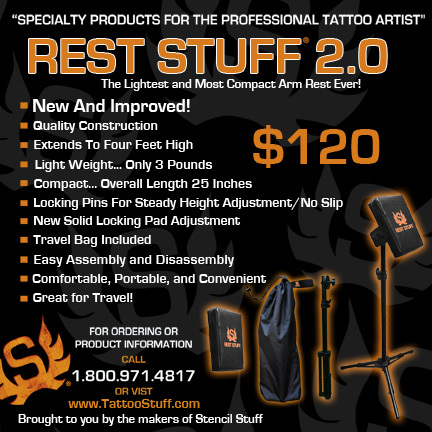 Rest Stuff 2.0 / Arm Rest... New and Improved! New Locking pins for steady height adjustment. New solid locking pad adjustment. The lightest and most compact tattoo arm rest available! High Quality Construction, Lightweight only 3 pounds! Extends to four feet high, Travel bag included, easy assembly and disassembly. This arm rest is comfortable, portable, and convenient. Brought to you by the makers of Stencil Stuff Products... Only $120.00 plus shipping. Shipping damage,or missing parts must be reported immediately upon receiving the arm rest.